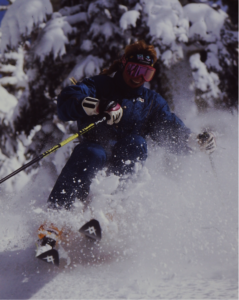 The fabulous Tina Vindum tears it up back in the day when all good women skiers skied on unisex models. Adding fuel to the LIB fire has been the relatively recent surge of interest in backcountry skiing, where lightweight design has always been a front burner issue, along with the proliferation of Big Mountain and Powder skis where trimming excess weight becomes a necessity if these giant skis are to float instead of sink. To cite a prominent example of the convergence of men’s and women’s models, consider the 2016/17 ski line from market leader Rossignol. Rossi’s star product, the wildly popular Soul 7 HD, comes in both a men’s and women’s iteration. Coloration aside, the two skis are, in a word, identical. My point isn’t that women deserve differentiated products, but that conscientious weight reduction that preserves high-level performance serves both genders equally well. The desire for a lightweight ski that’s easier to carry, more maneuverable and doesn’t ski like a barge despite a 106mm girth underfoot is one trait shared by both the male and female of the species. This is a variation on a theme that recurs across the ski universe: use the same mold for men and women, but switch the recipe of ingredients that goes into it. This is the tack Blizzard took this year with its Women’s Specific Design (WSD), that borrowed men’s molds wherever possible, but significantly changed the stuffing with the goal of reducing weight by 15%-20% while actually increasing torsional rigidity. Perry Martin demonstrates that what was old is new again, ripping into Alta on a unisex Big Mountain ski. Continuing in this vein, Blizzard and allied boot brand Tecnica recently announced a new initiative, Women to Women, a worldwide marketing and product development project intended to improve both the functional integration of women’s boots and skis and how that integration is communicated. The Women to Women project targets four areas for female-specific adaptation: Fit and Comfort, Stance and Balance, Warmth and Lightweight. 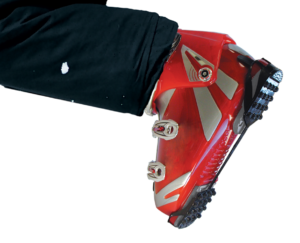 Expect to see functionally integrated ski/boot/binding systems for women from the Tecnica Group in the near future. Völkl has been on the LIB train for a while, paring weight from men’s and women’s models alike with its 3.D Ridge construction. The core models in its new Frontside women’s series, Flair, borrow their shapes from the men’s flagship RTM models, then take the weight reduction a step further with a milled-out Efficiency Core and lighter binding components. Head turned heads two years ago when it introduced a women’s line with all original molds, an event as rare as verified Sasquatch sightings. The Head women’s collection remains unique in not borrowing either shape or construction from its men’s line. Head took full advantage of its special access to Graphene®, the miracle component comprised of carbon atoms in a matrix one-atom thick, to make their women’s models ethereally light, but it would be a mistake to assume that Head always uses Graphene to lighten any ski they add it to. In its 2017 collection, Graphene appears in men’s recreational models as well as its all-world race skis, where lessening weight takes a back seat to managing flex distribution. For instance, when Head incorporated Graphene into their sublime i.Supershape series, they took advantage of the material’s lightness to add metal to these models. In pursuit of a LIB objective, Head discovered unexpected ways to not just trim weight, but improve overall performance. Salomon’s latest collection of all-mountain models, the QST series, arrived in both male and female iterations with scant distinction between the two, an acknowledgement that, at least within the freeride world, men and women can co-exist on the same shapes and constructions. The reconvergence of men’s and women’s ski technology serves as a reminder of something that was considered a given 25 years ago: strong women skiers should be perfectly at home on shorter lengths of men’s skis. Just yesterday I waited on a young lady named Anna who is super-strong and kinesthetically connected; she crushes a women’s 110-flex boot like it was made of margarine. A quick tour of Bobo’s extensive women’s wall revealed how few great alternatives there are for her special needs. But the array of men’s, aka unisex, models afforded a rich vein of options ideal for the gifted gal. Perspicacious readers of last week’s Revelation, Get a Grip, pointed out something I should have mentioned: souls sick of slippery soles have only to don a pair of Cat Tracks® and they can strut their stuff without losing their grip. 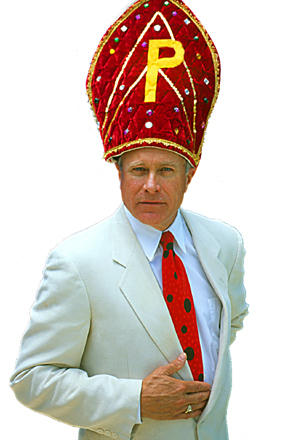 MSRP $19.95 at specialty ski shops everywhere.